1. Tell kids to say “please” and “thank you.” There’s no substitute for good manner. By regularly using words like “please”” and “thank you”, your kids will remember to be grateful while demonstrating respect for others. 2. Set an example. Kids learn a lot from watching their parents. Show them what it means to be grateful by offering a genuine “thank you” to a helpful neighbor, waitress who’s serving you food, someone holding the door open for you. 3. Make sure to say “thank you” to your kids. As parents, it’s easy to get caught up in the day-to-day and forget to show appreciation to our little ones. So when they do something kind or follow directions, remember to say “thank you.” it may seem like a small gesture, but they will know that’ you’re grateful. 4. Give them chores. Part of feeling gratitude is being aware of the effort that someone else when through to give us something. Involve your kids in household tasks so that they can see this effort. For example, if you feel like your child isn’t grateful for the meals that you them, involve them in the process. Let them see the time that it take to cook for the family so that they understand that food doesn’t just magically appear on their plate. They still many not like everything they’re served, but they will begin to appreciate the effort that was made. 5. Have them “work” for a reward. I’m sure that we’ve lost track of how many times our kid asked for a new toy or something fun. The next time your child wants another hour of screen time how about telling them that they have to do a chore before getting the reward. Receiving a reward after work makes the treat feel more well-deserved. 6. Volunteer as a family. Even very young children can volunteer in one way or another. Helping others helps to take away the emphasis on material things and reminds us to be grateful for what we have. Little ones can make artwork for children’s hospitals, volunteer in nursing hoes, help bake cookies to bring to a neighbor, or choose holiday gifts for children in need. Try to make volunteering, even in a small way, a regular family tradition to foster gratitude all year long. 7. Look for the positive. Help your children see the positive in even the most difficult situations. It’s easy to focus on the negative, especially when something doesn’t go our way. Helping kids focus on the positive will go a long way in helping them feel grateful in lie, even during the worst of times. 8. Create a daily gratitude routine. At dinner or bedtime, you can ask your child what they are grateful for that day. This helps kids remember what is good in their lives, and they should be grateful for even the smallest of things. 9. Count your blessings. Kids learn from observing. There’s no better way to demonstrate gratitude than by you showing how much you’re grateful for in life. 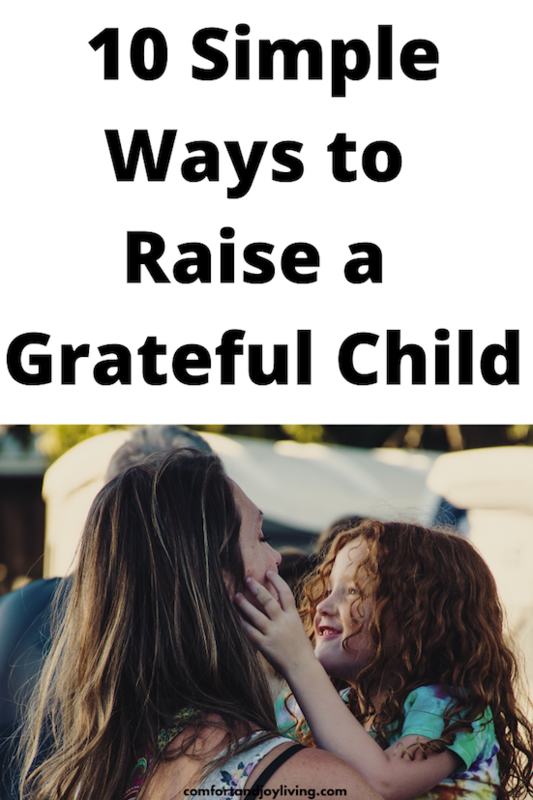 I try to regularly comment on what I’m grateful in front of my kids. For example, when I have piles of laundry, I’ll say something like “Thank goodness for my washer and dryer. I don’t know how our ancestor washed clothing over a rock in a stream!” Get in the habit of appreciating and sharing with your kids things that make our lives so much easier on a daily basis—especially the gift of a loving family and good health. 10. Give gifts of thanks. Encourage your child to think of people who help the, from teachers to coaches to neighbors, and say thanks with a written letter or cookies that they help bake. How do you make gratitude a part of your family’s life? Share your thoughts in the comments below.